Atlanta, GA - Feb. 1, 2018 – The 2018 International Production & Processing Expo (IPPE) has more than 31,000 poultry, meat and feed industry attendees from all over the world, approximately the same as last year. In addition, the show has more than 521,000 square feet of exhibit space and 1,218 exhibitors. Final numbers will be released next week. Sponsored by the U.S. Poultry & Egg Association, American Feed Industry Association and North American Meat Institute, IPPE is the world's largest annual feed, meat and poultry industry event of its kind. 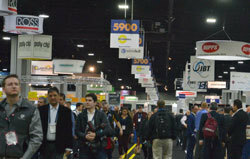 “This year’s exhibit floor and attendee and exhibitor numbers are a compliment to IPPE’s extensive education sessions, invaluable networking opportunities and diverse exhibits showcasing innovative technology, equipment and services. "The excitement and energy displayed by this year’s attendees and exhibitors will continue to ensure the success and growth of future IPPEs,” remarked IPPE show organizers. The central attraction is the large exhibit floor. Exhibitors displayed the most current technology in equipment, supplies and services used by industry companies in the production and processing of meat, poultry, eggs and feed products. Numerous companies highlighted their new products at the trade show, with all phases of the feed, meat and poultry industry represented, from live production and processing to further processing and packaging. The wide variety of educational programs complemented the exhibits by keeping industry management informed about the latest issues and events. This year’s educational line-up featured more than 140 hours of education sessions, ranging from packaging trends and technologies, to feed production education, to researchers presenting findings on poultry disease, quality and behavior. Also, remember to save the date for the 2019 IPPE. With the Super Bowl coming to Atlanta in 2019, the IPPE show dates have been moved to Feb. 12 – 14, 2019. Mark your calendar to note this change in the IPPE trade show schedule for 2019 only.